More info:Price (per person) based on 2 adults sharing a room for 4 nights on B&B basis. Also includes group walking tour in Edinburgh, full day private guided tour of Hadrian’s Wall, and return rail travel in standard class from Edinburgh to Haydon Bridge. This five day tailor made trip starts in Edinburgh, Scotland’s magnificent capital city where you will spend two days enjoying its historic highlights. The best way to do an Edinburgh tour is on a guided walk around the ancient city centre, which we organise for you, to help get your bearings and learn more about the city’s natural and cultural heritage. Between this, and plenty of free time to explore, you can take in all the city’s sites, including the famous castle, Arthur’s Seat, the Scott Monument and a plethora of shops and museums. Edinburgh is an easy city to navigate, with wonderful architecture, ancient pubs and tiny shop and galleryfilled alleys. And with a local guide on hand, you will hear plenty of the history, folklore and contemporary tales too. Your accommodation in Edinburgh is one of our favourites, an elegant four star hotel near the city centre. From Edinburgh, you head south of the border by train, on one of the UK’s finest rail journeys that clings to the dramatic coast of Northumberland, overlooking the North Sea. After changing trains at Newcastle, you head inland for another beautiful journey through the gentle undulations of the Tyne Valley, your final stop being Haydon Bridge. This is a small town tucked into the valley, and the gateway for visiting Hadrian’s Wall World Heritage site and Roman forts. After checking into your friendly, locally owned guesthouse, you have half a day left to explore the area yourself, followed by a full day’s guided tour tomorrow of the Wall from an expert local guide. Hadrian’s Wall is one of the UK’s most stunning historic sites, stretching for over 100km between the west coast and the east. Dating back to AD128, it was built by the Romans as a defence against the Scottish Pict tribes. Consequently, there are remains of castles, forts and Roman towns all along the route of the wall. Some of the Wall’s highlights include the Roman Army Museum, Vindolanda’s archaeological digs and the fine forts found at Chesters and Housesteads. Your final day is for your onward journey, and we are happy to help arrange the logistics of this for you. We encourage our customers to try local produce – and provide recommendations for the best places to visit to do this. From seaweed lamb on Shetland and Orkney to langoustines, crabs and scallops caught off the west coast; from many varieties of Scottish cheese to all sorts of Irish bread and baking… not forgetting local ales from microbreweries and the chance to sample a dram of Scotch whisky or Irish whiskey. The accommodation providers we select share this commitment – many have kitchen gardens growing their own herbs, salad and vegetables, and some even have chickens roaming in the grounds to provide eggs for breakfast. Dinner menus focus on local specialities. We make it possible for our holidaymakers to learn more directly from the producers, through a trip with a creel fisherman, a visit to a Scottish oyster farm or a holiday uniquely designed in association with Good Food Ireland. We build close and lasting relationships with our business partners, based on mutual trust and an unerring commitment to customer satisfaction. We directly employ a small team of local people in Glasgow. We offer part-time and flexible working. 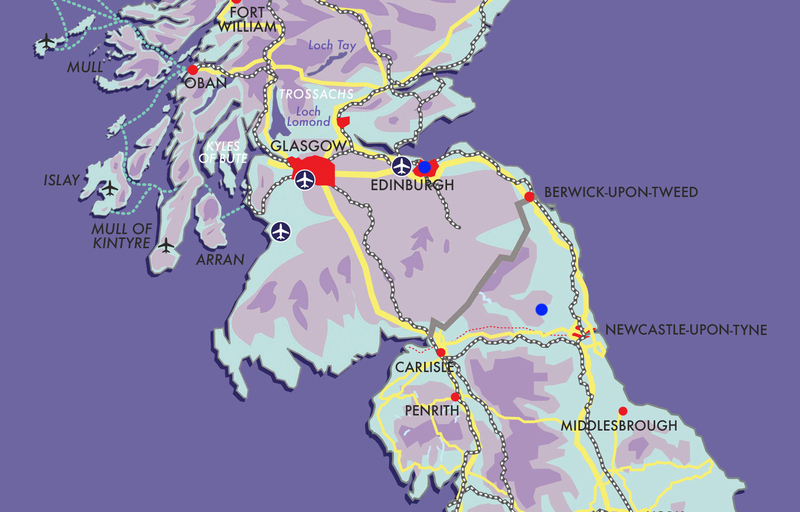 We ensure staff take undertake at least two recce visits in a year so that they have first-hand experience and knowledge of our products throughout Scotland, England and Ireland. All staff share our values of environmental and sustainable responsibility.